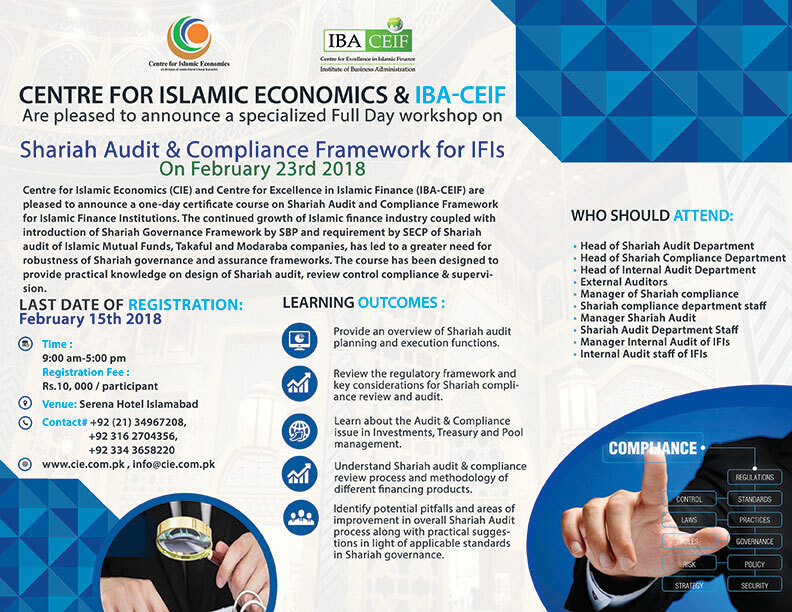 Centre for Islamic Economics (CIE) and Centre for Excellence in Islamic Finance (IBA-CEIF) are pleased to announce a one-day certificate course on Shariah Audit and Compliance Framework for Islamic Finance Institutions. The continued growth of Islamic finance industry coupled with introduction of Shariah Governance Framework by SBP and requirement by SECP of Shariah audit of Islamic Mutual Funds, Takaful and Modaraba companies, has led to a greater need for robustness of Shariah governance and assurance frameworks. The course has been designed to provide practical knowledge on design of Shariah audit, review control compliance & supervision. Provide an overview of Shariah audit planning and execution functions. Review the regulatory framework and key considerations for Shariah compliance review and audit. Learn about the Audit & Compliance issue in Investments, Treasury and Pool management. Understand Shariah audit & compliance review process and methodology of different financing products. Identify potential pitfalls and areas of improvement in overall Shariah Audit process along with practical suggestions in light of applicable standards in Shariah governance. Certificate, Course Material and Refreshments will be Provided.